This short lived Eighties band featured Steve Jones on all tracks, along with Michael Des Barres (Power Station tour vocalist), Clem Burke & Nigel Harrison (Blondie) and Tony Fox Sales (later of Tin Machine). 16 years after its original vinyl release by EMI America this is the first time it has ever been available on CD. 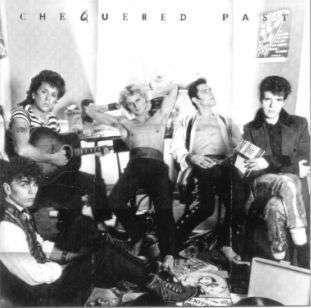 The artwork still remains the same, and the group still look like something out of an Eighties 'New Romantic' circus (black eye included!). The music is a cross between 'Rock' and 'American New Wave', and probably fitted in well in 1984, however 16 years later it does sound a little dated. At the time Jonesy was in deep with heroin, but it doesn't affect his playing on the album at all. The production on his guitar is awesome and powerful. In fact, the whole album, produced by Michael James Jackson, has a very 'big' sound to it. Des Barres vocals sound like a cross between Ozzy Osborne and Rod Stewart, but they're a snug fit with the Steve Jones wall of sound guitar, which can really be heard on tracks like; 'A World Gone Wild', 'Never in a Million Years' & 'Only the Strong Will Survive'. 'No Knife' is the album's ballad, a folky acoustic number written by Des Barres (slide guitar included). 'Let Me Rock' is as crap as the title (boring Heavy Metal). 'How Much is Too Much' starts off sounding like John Cougar Mellan-Camp until Steve's guitar kicks in, and then ends up sounding like Status Quo on acid! In my opinion it's the best track on the album, along with 'Never in a Million Years'. Steve co-wrote all but two tracks, and if you're a fan of the Steve Jones/Professionals guitar sound, then buy it. If you're a Lydon/Pistols fan - don't buy it!